Product, Mounting, and Positioning information is available below. Our line of nets without knots, manufactured from high tenacity polypropylene, represent a new concept in netting and has been made possible by the application of the highest technologies applied to the manufacture of safety netting. These nets are manufactured according to the EN 1263-1 Standard and are outstanding due to the following attributes. Use: Horizontal protection (building shafts, industrial warehouses, bridges,etc.). With 30 kN border rope. Class A2 (Minimum breaking energy 2.3 kJ). Dimensions: As necessary (more than 35 square metres). Net: With mesh dimensions of 100x100 mm. Manufactured in High Tenacity Polypropylene with anti-solar treatment or in High Tenacity Polyamide. Rope/trial mesh: Lodged in the safety net to determine the deterioration due to aging. Passed through the exterior meshes of the net and tested in accordance with the requisites indicated in the UNE EN 1263-1 standard. Objective: Attach the net to the structure of the work. Minimum breaking load: 30 kN or 15 kN (double strand). Objective: Joining together of nets. Minimum breaking load: 7.5 kN. Steel cables: Minimum break load: 50 kN. Carabiners: Minimum break load: 20 kN. Whatever your requirement for the supply of safety netting we are able to provide a solution. As the New Zealand arm of Leon de Oro, an internationally successful safety netting manufacturing company, we can supply products from standard to custom designed nets. The safety nets must be installed as close as possible to the level of work. 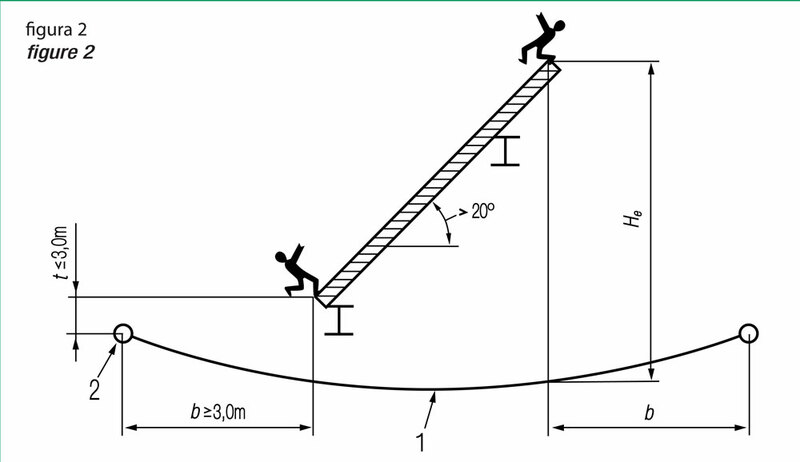 The working heights Hi and He must not exceed 6 metres (see Figures 1 and 2 below). 2. 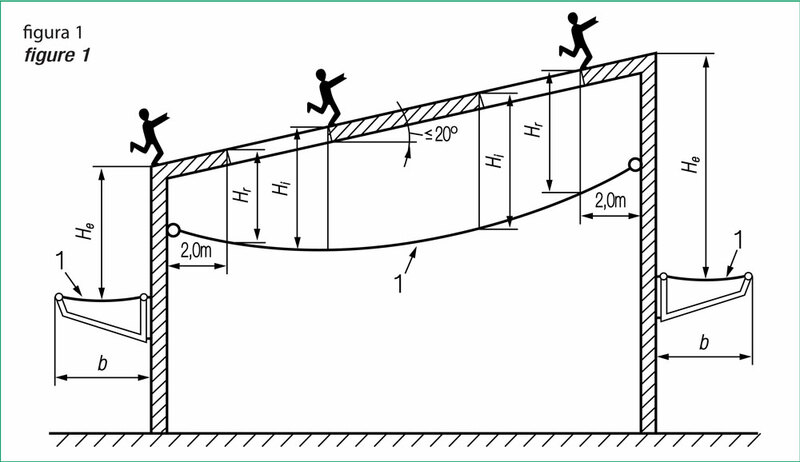 The distance t between the extreme place of work and the lowest point of the edge of the safety net will not exceed 3 metres (see Figure 2). The installation system for the System S safety nets can be different depending on the dimensions and the areas where they are to be installed. They may be for large shafts in buildings or for protection in industrial warehouses. The safety nets will be installed at the anchor points by tie ropes capable of resisting the characteristic load. The distance between the anchor points must be less than 2.5 metres. If various nets are used, extend the nets on the floor. Sew the nets with joining rope ensuring that there are no gaps of more than 10 mm. In buildings with large shafts, hooks will be used to fix the net to the edge of the roof, and the border rope will be passed over them. The hooks should be of galvanised steel and positioned every 50cm. Pass the border rope through the fastening hooks and close the hooks to prevent the rope from coming out. Use tying cord to fix the metal structure. Manufactured in various colors: green, blue, red, orange, purple, etc. Your message has been sent. Thank you! We will be in touch with you shortly. Copyright © BESAFE Supplies Ltd.